Cape Wineland Wine Tasting Tour. South Africa April/August 2018:Has the dream been realized? Eastern Cape Wild Coast Walk. Cape Town Wineland and Food Day Tours. Cape Town Self Drive Tours. 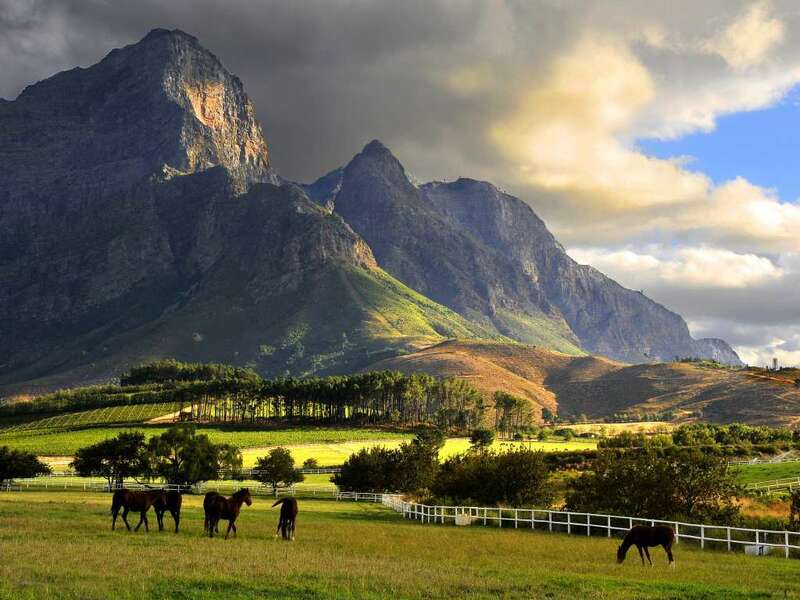 This Cape Wineland Wine Tasting Tour combines as it does sight-seeing in Stellenbosch, Franschhoek and Boschendal with visits to small select wine estates for a cellar tour and wine-tasting. On this Cape Wineland Wine Tasting Tour we will stop for lunch own account with this tour as there are a number of excellent restaurants in the Winelands and enjoying a leisurely gourmet lunch is a very enjoyable part of the day. We usually visit Haute Cabriere, le Petite Ferme or Monneaux restaurants.These are not set in stone,and we can be as flexible as we want to be. This day can be modified to accoodate non drinkers by turning into a Wine, Cheese and Chocolate Tour. However some folks prefer to have a greater emphasis on wine-tasting and buying,perhaps meeting the winemaker at an estate and enjoying a vineyard tour. 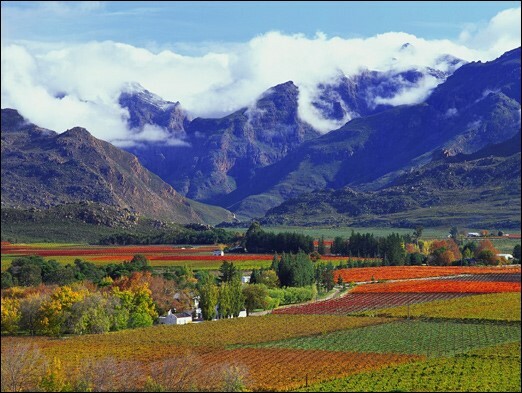 Your Cape Wineland Wine Tasting Tour begins when are collected by your private guide (who holds a Cape Masters Wine Certificate) for your private wine tour. A combination of the favourable effects of the two major ocean currents meeting off the Cape makes the climate in the Cape Winelands perfect for wine-making. 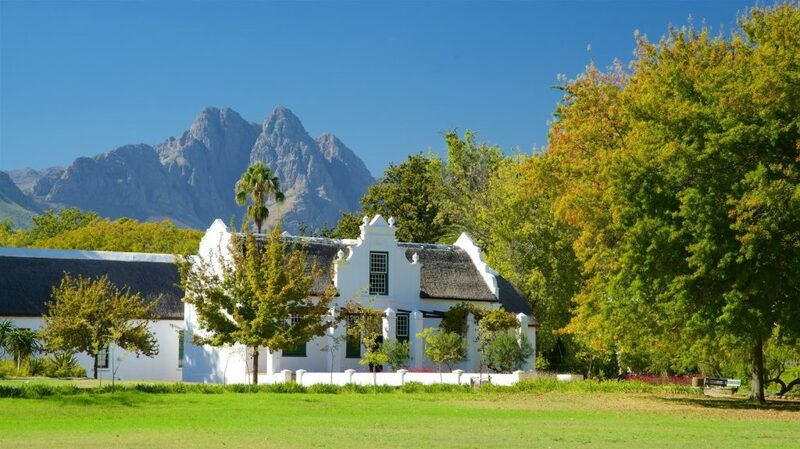 The stunning backdrop of the Hottentots Holland mountains, the white gabled Cape Dutch Homesteads and the oak-lined streets and lanes all blend together to give the Winelands a charm that will not be quickly forgotten. Your first stop is historic Vergelegen wine estate where we debate award-winning André van Rensburg’s claim that he has “the best red wine area in South Africa”. Typical Cape Dutch Architecture that you will find in the Cape Winelands. A tour of the state-of-the-art wine cellars and Vergelegen homestead is followed by wine tasting. You continue to Stellenbosch, a historic university city with charming Cape Dutch architecture amidst oak-lined streets, for a walking tour. You meander along the unspoilt Dorp Street and visit the Village museum – preserved houses which yield a fascinating insight into the lives of the early settlers. After lunch at Delaire wine estate with its magnificent views over the valley, you have a private tasting of the fine white wines of Thelema at the top of the Helshoogte Pass or a tasting of wine and chocolates at the Waterford Estate, home to the wines of Kevin Arnold. This outline can be adapted if onehas an interest in specific type of wines. The tour will visit Franschhoek, this pretty village is brimming with joie de vivre and is easily explored on foot. Spend a little time for browsing in the art galleries, bistros and shops and sampling some of its excellent restaurants. The origins of this beautifully situated village date back to 1688 when some of the French Huguenots fleeing religious persecution settled in the valley. We return back to the hotel later afternoon ie between 430 and 530p ish. Tailor made Africa Safaris and South Africa Tours. Africa Safari combinations and possibilities a plenty.... Sleep under the stars experience, A en suite Luxury tented camp, Boating the remote channels of the Okavongo Delta... Photographic safaris. Contact us by using our Design your Africa Safari/South Africa Tour Form. Ever thought of choosing your Safari by a bathroom? Safari game viewing as you lie in your bath.See for your self.